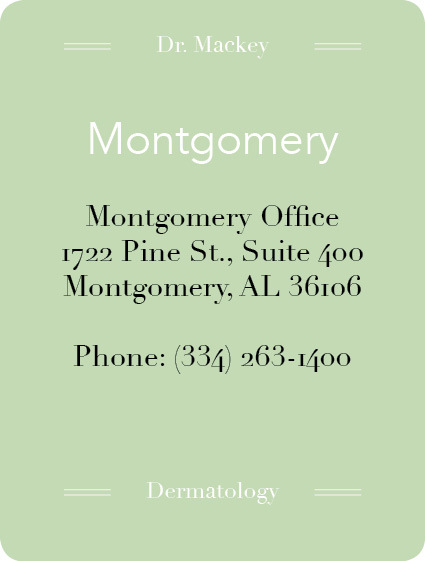 Steven Mackey, MD Dermatology, is a leading dermatology practice with four locations in Alexander City, Sylacauga, Montgomery and Prattville, Alabama. Dr. Mackey and his staff understand the importance of quality skin care and are committed to providing exceptional treatments in a professional, pleasant atmosphere. We recognize that every patient has different needs, and we pride ourselves in the courteous service we deliver to each person who walks through our doors. Whether we’re addressing your skin cancer concerns, explaining different acne treatments or informing you of the latest cosmetic injectables, our top priority is ensuring that your experience is second to none! Your skin deserves the best, and we thank you for choosing Steven Mackey, MD Dermatology to keep your skin healthy and beautiful for years to come. The offices of Dr. Steven Mackey offer their patients a full spectrum of both medical and cosmetic dermatology. Take a look at the long list of specialties. Please give us a call to make an appointment or set up your consultation. Dr. Steven Mackey has served thousands of patients over several decades. Very experienced and knowledgeable about the field of dermatology, he has a real passion for practicing dermatology. We are proud to bring you the latest in cosmetic dermatology. From coolsculpting to all types of fillers and microdermabrasion. Our trained professionals have many years of experience and expertise. Call on us for all your cosmetic desires. We have four locations in Alabama. Our offices are in Alexander City, Montgomery, Prattville and Sylacauga. Choose an office that is convenient for you and schedule your appointment today. Sign up for our newsletter and be the first to recieve the latest news about events and specials!